This article first appeared in City & Country, The Edge Malaysia Weekly, on July 3, 2017 - July 09, 2017. The scene in Kota Kemuning on most mornings is one of senior citizens strolling around the housing estate or the man-made lake and the younger folk either rushing off to work or walking to school. Not many will know that this was all plantation land until 1994 and was transformed into what it is today by DRB-Hicom Bhd and Gamuda Land Bhd. 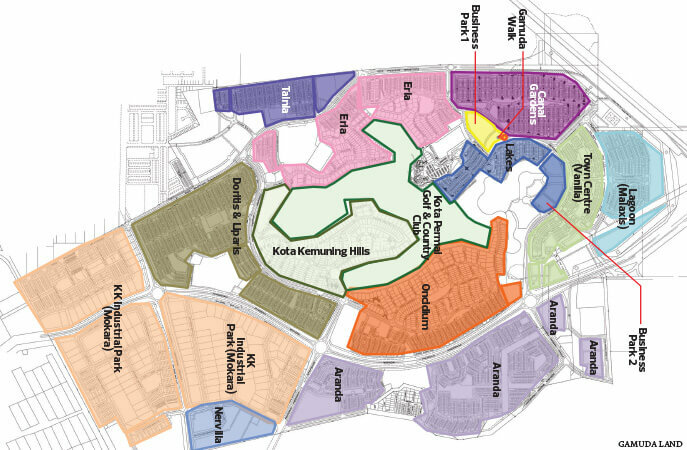 Covering 1,820 freehold acres in Shah Alam and featuring residential, commercial and industrial properties, Kota Kemuning is located off the KESAS highway and is easily accessible via the latter, Lebuhraya Kemuning-Shah Alam (LKSA) and the Federal Highway. In the future, the proposed West Coast Expressway will link it directly to Perak from Banting, Selangor. Now a vibrant township with many conveniences and amenities, such as schools, restaurants, banks, hypermarkets and hotels, Kota Kemuning also boasts the 18-hole Kota Permai Golf and Country Club and more recently, the community lifestyle retail centre, Gamuda Walk. Their affluence has had a direct impact on the businesses here, especially F&B, attracting a wide variety of them, including Subway, Baskin Robbins and Domino Pizza, and according to Ship, “novelty” eateries, such as Imbi Road Noodles, Jin Man Noodles, and Samy and Min Bak Kut Teh, have also succeeded in the township. Kota Kemuning also has an abundance of open green spaces, he adds, especially in the lakeside area where people can engage in sports activities or congregate for social activities like tai chi and meditation. “Basically, house hunters in Kota Kemuning have few concerns when it comes to committing to a property here. For example, if they are single or have just one income, they could go for the 20ft by 60ft or 20ft by 70ft terraced houses that are priced from RM400,000 to RM560,000. A married couple would want bigger rooms to cater for their growing family and if they have double income, they could go for the 22ft by 75ft or 24ft by 80ft terraced houses that are priced from RM600,000 to RM700,000,” says Ship. According to Raine & Horne International Zaki + Partners Sdn Bhd executive director Lim Lian Hong, the success of Kota Kemuning’s property market is due to the spillover from successful areas such as Subang Jaya and Petaling Jaya. It does help that the township is well designed and self sufficient. “Kota Kemuning is also located close to Kuala Lumpur and caters for people working in Klang, Subang and Petaling Jaya. And because the population has grown, the number of people here can support the commercial activities of the township. All this has driven up property prices,” says Lim. 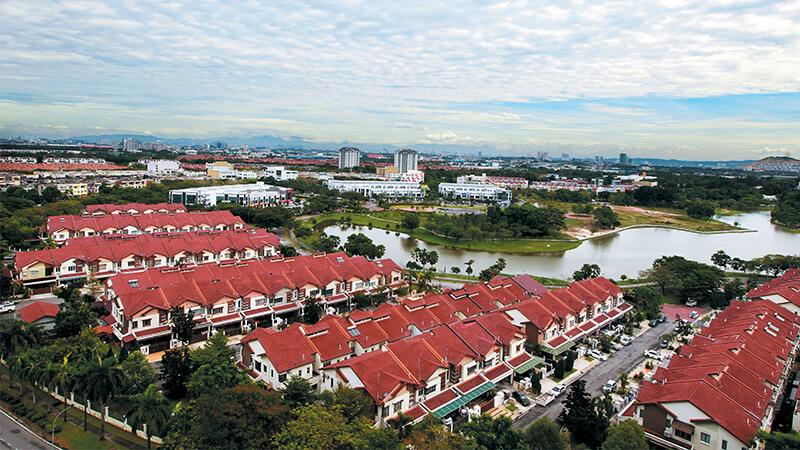 According to LaurelCap Sdn Bhd director Stanley Toh — who agrees with Lim that Kota Kemuning’s success has been because of the spillover effect from Subang, particularly Subang USJ — the well-planned township is suitable for young families. On whether it planned additional infrastructure in the township, Gamuda Land says such decisions come under the Shah Alam municipal council. 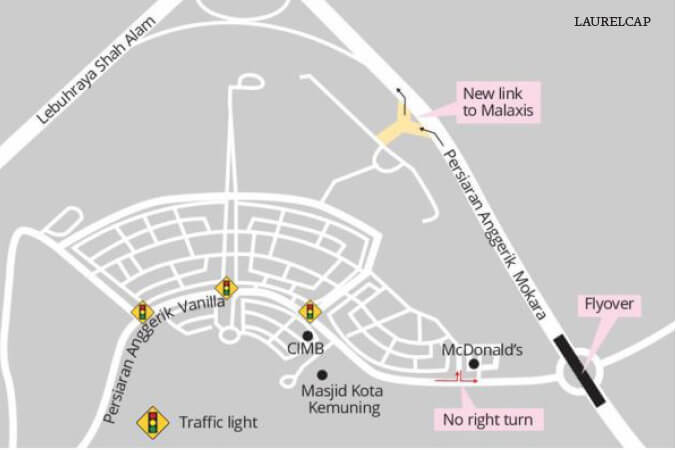 Amid talk of a light rail transit (LRT) station coming up in Kota Kemuning, Gamuda Land says there is a proposal under the Selangor Public Transport Master Plan for an extension from Putra Heights, adding though that there are scant details. Nonetheless, Kota Kemuning’s well-earned reputation and its population of 200,000 continue to keep its property values strong. Nonetheless, the prices of residential properties in Kota Kemuning have risen steadily over the years. According to Lim’s data, the developer launched 20ft by 70ft and 22ft by 75ft two-storey terraced houses and apartments in Anggerik Aranda, one of the oldest phases, between 1995 and 1997. They went for RM167,000 to RM230,000. 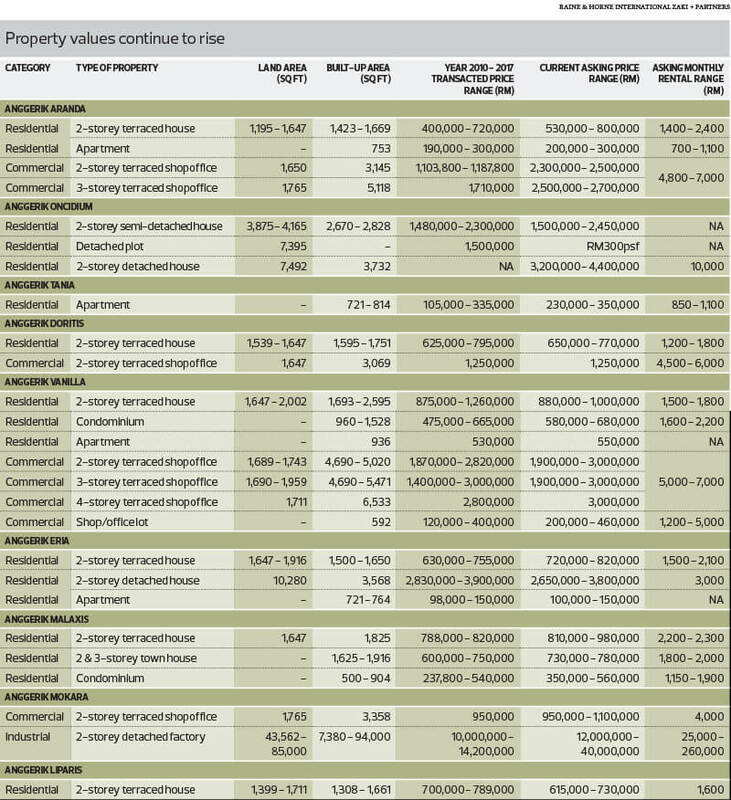 From 2010 onwards, the asking prices for these terraced houses with built-ups of 1,423 to 1,669 sq ft have ranged from RM400,000 to RM720,000 while rents have ranged from RM1,400 to RM2,400 per month. According to LaurelCap’s Toh, the rental yield on landed properties in Kota Kemuning is low because the majority of them are owner-occupied. Commercial properties in Kota Kemuning comprise mainly 2 to 4-storey shopoffices and shoplots. Most of them are located in Anggerik Vanilla, the town centre, and were launched between 1996 and 1997. There is also a sprinkling of shopoffices and shoplots in the residential precincts to cater for the market there. According to Lim’s data, the 3 to 4-storey terraced shoplots in the town centre with built-ups of 4,690 to 5,471 sq ft were offered at RM570,000 to RM675,000 but they have been transacted at RM1.4 million to RM3 million since 2010. Lim points out that the shoplots facing Persiaran Anggerik Vanilla, the main road, are well occupied but many of the units in the back row, behind Hero Market, are empty. The rental yields are between 4% and 5%. Says Toh, “The rental market for shopoffices is holding steady despite new units coming up in Kota Kemuning Business Park 1 & 2 and Gamuda Walk.” He adds that the rental rates are between RM1.80 and RM2.20 psf. Most of the industrial properties and factories located in Anggerik Mokara were launched between 1995 and 1996 while a few more were launched in 2006. The selling prices of the 1 to 1½-storey terraced factories with built-ups of 3,251 to 3,897 sq ft were RM290,000 to RM425,000. According to Toh, these properties were transacted at RM800,000 to RM1.75 million between 2012 and 2016. He adds that the factories are mostly owner-occupied and their rental yields have not risen over the years, staying at 5% to 6%. Raine & Horne’s Lim notes that the construction of the South Klang Valley Expressway and the West Coast Expressway boosted the prices of industrial lots in Kota Kemuning — from RM60 psf in 2010 to RM170 psf in 2015. Kota Kemuning’s popularity has resulted in new projects coming up on its fringes. One such development is HomeTree by Johor-based developer BCB. The 150-acre leasehold, mixed-use development was launched in 2013 and is coming up in five phases. Phases 1 to 3 are residential while Phases 4 and 5 are commercial. Meanwhile, Knox Wawasan is developing serviced apartments called GEO Residences close to the AEON Big hypermarket in Bukit Rimau. The freehold project has since been launched. Then, there is Residence 33, which was launched by Poly Ritz in 2011. It features only 33 bungalows, which have been completed and are fully sold. Also just completed is Alamia Homes @ Kemuning Harmoni by Kualiti Kinda Sdn Bhd, a wholly-owned subsidiary of Y&G. Consisting of 20 three-storey semidees, the project was launched in 2015 and is 70% taken up. In fact, he sees some difficulty in maintaining the growth momentum in the values of Kota Kemuning’s residential properties due to physical and functional obsolescence. Moreover, he says, property development is expanding outwards to Kuala Langat, where Bandar Rimbayu (1,879 acres), Eco Sanctuary (309 acres), Tropicana Aman (863 acres) and twentyfive.7 (257 acres) are located, and he sees more such developments in the future. But in the meantime, Kota Kemuning continues to hold court and fulfil the aspirations of its young and growing population.